Stocks in London are set for another slide on Thursday as worries over US-China trade relations and Brexit-related fears continue to weigh on the minds of traders. Futures indicate the FTSE 100 index of large-caps to open 62 points lower at 6860 after closing 1.4% lower at 6921 yesterday. In the latest Brexit developments, Theresa May has been given a stark warning that her premiership could end if she goes ahead with her Brexit deal. MP's in the UK are due to vote on the deal on December 11. Moving lower for the 2nd day in a row, the FTSE 100 ended Wednesday at 6921 tanking £100.96 yesterday. This is the biggest single-day loss in over a month. Today's open at 6860 marks the lowest recorded opening price since March 26th. 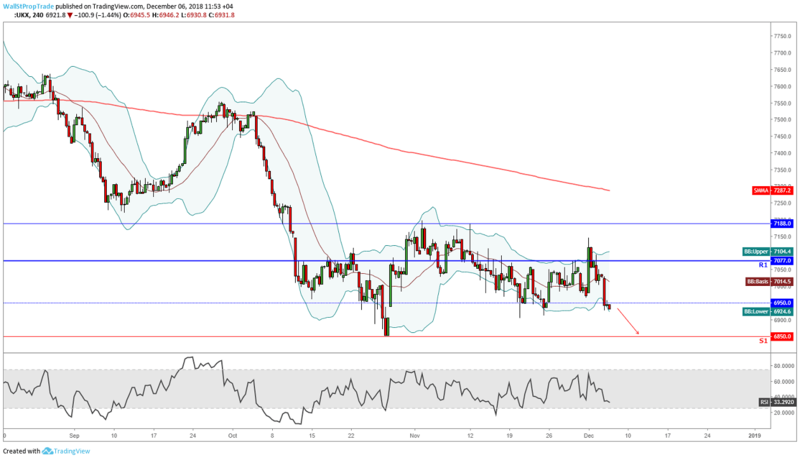 The bears were in full control yesterday and this will most likely drag markets lower today as well as prices broke below the key technical support level at 6950. Further selling could move prices lower should the market test November's close-by low at 6904. Additionally, with prices trading close to this year's low at 6850, downside momentum might accelerate should the Footsie break out to new lows for the year.